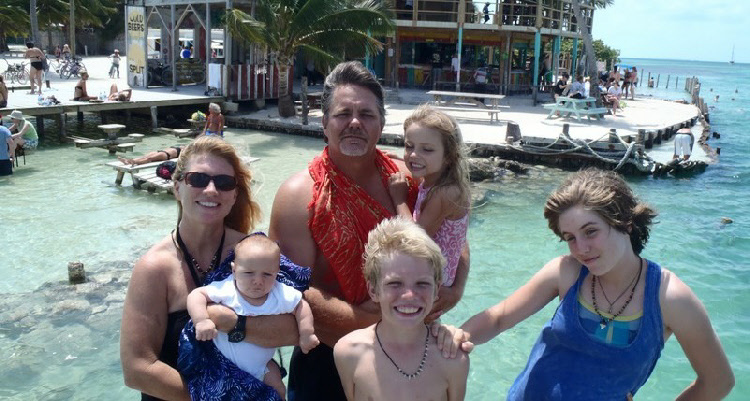 In October 2004 my wife and I sold everything we had, packed up our two small children and moved to Belize. We had never even visited Belize but a friend of ours bought 165 acres in the jungle and was looking for someone she could trust to set up a business there. I left my idyllic life as a fishing guide and the comforts of home for the unknown challenges of Third World living. It seemed like a good idea at the time. We arrived in Belize to oversee the final stages of construction on a restaurant and our home. Two months later we opened for business serving food and renting canoes to people visiting a nearby national park, Barton Creek Cave. The many challenges of our business included the cost of getting supplies down 9 miles of bad dirt road, the uncertainty of daily business & thieves. We established good relations with many local tour guides but we also unknowingly extended our hand to a few unsavory characters and eventually that bit us in the backside, as it does. Four and a half years later we shifted the focus of our business to hosting backpackers. Initially we had them sleeping all over our restaurant deck for free and made money by feeding them and getting them on tours. Eventually we bought a bunch of tents that we would rent and a couple years ago we built a dormitory style bunkhouse to house our young travelers. During the course of this time we brought a few university groups in from the US to do some community service work in the area and we hosted a couple church mission groups as well. Financially, we often struggled but we live in such an amazing place that it seemed palatable. After hosting international travelers for 8 years we have recently decided to make a big change. No longer will the Outpost host overnight guests! No longer will my wife be barefoot and pregnant in the kitchen making meals for travelers! (To be fair she was only pregnant 19% of the time.) No longer will we be obliged to answer the same questions over and over! (“How did you end up in Belize?” “How did you find this place?”) No longer will our holidays be exclusively devoted to other people’s enjoyment! No longer will we have the steady income from travelers who sought us out through internet, guidebooks and online forums! No Mas! The past few weeks have been very nice. The Outpost is our home and it feels more like it today than ever. I have taken over the homeschooling of our 14 year old daughter and we are learning Algebra together! My 11 year old son and I are sharing the joys of long division! As I lie in a hammock and write this I can gaze out over some of the most beautiful jungle scenery Belize has to offer. Due to the recent rains there are a few mosquitoes hovering around me but I have had Dengue Fever twice and I don’t think I can get it again. Maybe I’ll Google that. Over the last 8 years I have learned how to build websites. Mostly I have muddled through on my own but some friends have also helped me along the way. I recently started Belize Websites and now spend the better part of my days on my laptop building, updating & marketing websites. Belize is not a country full of opportunity but there is no question that business in Belize needs to be dragged onto the internet. I am building websites for a few people and I have just launched another one of my own, www.ForSaleByOwnerinBelize.com. I offer people the chance to list their homes, property or businesses for sale, no up-front cost but a 2% commission if I provide them a buyer. Additionally, I operate www.CraigsListBelize.com where people can list all kinds of stuff for free. The real estate listings appear on both sites and in the last 5 days have averaged about 500 views per day. The numbers rise weekly since I have been putting my efforts into marketing the sites. I only launched the For Sale By Owner in Belize site just over a week ago and am getting new listings every day. The Craigs List Belize site has been up about a year. I have sold 12 acres of ours and two of our vehicles through that website as well as many things for other people. I am hopeful about the future of the business those sites can create. We are about to list our house on a couple of vacation rental by owner sites so we are doing some improvements there to get that ready. It also looks like we will subdivide a few lots from the 165 acres here and sell them to people who we can stand to live next to. We will offer our care-taking services to buyers who want to build and may not live here full time. We can also oversee building efforts when that time comes. The Outpost facility & swimming hole would be a kind of community center to the few owners we would selectively bring in. Our new neighbors may consider renting their homes through us for vacation rental in their absence. In addition to the real estate side of things my wife is focusing her energies on making the most of things here at the Outpost. Jacquelyn is doing an incredible job of putting flower arrangements together and we sell those. For years we have operated a quasi-nursery here and she is ramping up her efforts to sell more potted and bagged plants & flowers. We are also making Barton Creek Outpost available to rent for daytime events, luncheons and retreats. On 4 June 2012, 13 year old Jasmine Lowe was reported missing by her father. She left her house to go to her mother’s salon in San Ignacio but never arrived. At about 2:00 pm on 6 June her body was discovered in a field. Due to the rapid rate at which her body was decomposing her father was told by the authorities she should be buried immediately. He received permission to bury her on his land a few hundred yards downstream from us on Barton Creek. At 6:00 pm we received a message that people were on the way. We did what we could to prepare to assist. Jasmine and her father, Chris, were some of the first people we met in Belize, our children were about the same age and we all became friends. They were regular visitors to Barton Creek Outpost and were involved in most of our kids’ birthday parties and other events through the years. We often called young Jasmine, “J-Lowe” to distinguish her from the other Jasmine in their circle of friends, “J-Fo”. We called the group of girls “The Jungle Pixies” and, when they were younger, they dreamed of forming a band of the same name. Chris is a chatty guy with hundreds of stories. He will sometimes sit with our guests and regale them with tales of old Belize where no roads were paved and they road in old British military flatbed trucks instead of busses. The guests love it. Chris also makes and distributes amazing granola, granola bars and is the only producer of peanut butter in Belize. The news of Jasmine’s disappearance was hard on all of us but we held out hope that somehow she would come home safely. I was cutting the grass when my wife came down with bad news, Jasmine’s body was found. We quickly called the kids together to tell them but as we were trying to get our 13 year old daughter to join us we heard a terrible cry. A close friend of hers, temporarily schooling in Germany, had informed Kaitlyn (through Facebook) of the news. Jacquelyn and I gathered our children together to cry and pray. We were all distraught but Kaitlyn was inconsolable, our daughter had lost a close friend by horrible means. Our sweet Kaitlyn has not experienced a lot of pain in her life and something of this magnitude was like a ton of bricks. I wept for her loss of a close friend as well as the punch in the gut she received as the cruelness of this world was exposed to her. I am sorry honey, now you know. When we received word that people were on the way out here to bury Jasmine we got changed and considered making refreshments, we figured we would see a few people over here at some point. I put on work clothes, loaded some shovels and a pick into the truck and we decided Jacquelyn would stay at the Outpost with our two youngest children. As I was gathering flashlights and changing batteries questions about this whole scenario were running through my head and I found myself suddenly motivated, rushing around, doing this and that. I stopped and wondered what I was doing, “Are you excited to dig Jasmine’s grave?” I pondered that question for a few moments and determined I was relieved to be actually doing something. Since the first news of her disappearance I have felt useless. Everyone has been asking, “What can we do?” and feeling helpless. At least now I thought I could contribute to the situation in some way. Kaitlyn, our 11 year old son, Logan, and I loaded in the truck to go meet the incoming people. The gate to Chris’ property is only a few hundred yards from our place and shortly after arriving there a couple vehicles showed up. Chris has been a licensed tour guide here for many years and has a lot of friends who are tour guides. About 6 of them showed up and they also had tools to dig a grave. As we were breaking out tools and formulating a plan we began to see headlights coming down the dirt road and lighting up the misty night. I had envisioned a few guys digging a grave and our Pastor (Chris and Jasmine attend the same church that we do) would say a few words as we covered her resting place. No so. Trucks and SUV’s began to arrive in groups of two and three with most carrying a load of mourners. If you are not familiar with the use of a pickup truck as a mass transport vehicle in a third world country, well, I assure you it is something that would give a Tennessee State Trooper a heart attack. We sometimes pack them full, making use of every inch of available space. Several vehicles arrived full of Jasmine’s Scout Troop with one pickup packed with at least 25 people. I quickly broke away to retrieve my wife & two little ones and when I returned I continued directing parking efforts into a large, dark, slightly muddy field. From the black interior of many vehicles I heard, “Hey Jim”, greetings from people whose faces I could not see. Chris had shown up, Jasmine’s mother & her church, more tour guides, a school bus, vans, cars, trucks and our entire Wednesday night church service showed up driven by our Pastor and his wife. The group would not hear of being left behind despite the fact they were told they would have to wade through a creek, in the jungle, at night to get to the site. Jasmine’s body was delivered as well. As it turned out, a few tour guides manned some canoes and ferried people across the creek while others hiked through the dark bush and over a high, sketchy, swing bridge to make the crossing. There never seemed to be enough flashlights but everyone was helpful and I suspect about 150 people made that crossing. It could easily have been more. When it seemed that the flow of vehicles had stopped I crossed the bridge and headed towards the site. As I made my way to what the children called, “The Beautiful Spot” I recognized the intoxicating scent of Night Blooming Jasmine, the significance of it brought more tears. Chris and Jasmine lived here when they were not in San Ignacio and they planted a wide variety of fruit trees and tropical flowers. It is a hidden paradise with a fresh spring running through the plot and it was their favorite place to be. The scene at the site was surreal. In the clearing, people were milling about holding candles that cast moving shadows over their faces and the surrounding jungle. A small generator hummed somewhere, whispered conversations, crying, the occasional laugh and people hugging everywhere. I found Jasmine’s small, white casket covered with flowers and a picture of a “Missing Child” poster of which she was the subject. Her casket was supported by 4 buckets as if they were the legs of a table. I prayed there and I hugged her sister, Suleny, expressing words she had probably heard too many times already. Suleny stayed there for some time as if to be close to her sister one last time. I hugged my wife, loved on my children and felt like an extra in a bizarre movie. As I was aimlessly wandering about I ran into several friends including my Pastor, Mike Leonard, of Shining Light Baptist Church. I am not sure I’m much of a Baptist but I like Mike. Mike is a good ole boy, spent 7 years in Army Infantry and is flat out committed to his mission. Those are three of the reasons I like him. Pastor Mike and I walked around a bit, spoke with people and watched men younger than us dig a deep grave in the jungle. A police officer supervised the work and was the one to make the call when it was six feet deep. I think it took over three hours. I happened to be standing right there when the officer deemed we were ready to proceed and we found there was really no plan on how to transport the casket to the grave. I told Chris I would be honored if I could help carry Jasmine’s body and he consented. Six of us, including two Mennonites, carried her through the spring and over to the site, Chris alternately helped and took pictures. As we were carring the casket our church congregation sang Jasmine’s favorite hymn, “I’ll Fly Away”. Ropes were not immediately at hand so we waited while some tour guides retrieved some so the casket could be rigged to lower. A world of emotions swept over me as I lowered Jasmine Lowe’s body into that hole. As I consider it now I think, “Dear God, please don’t have me do this for my child”, was the foremost. When the time came Pastor Mike stood upon the large pile of rich earth and gathered the crowd. With bare light bulbs strung over the grave and the generator in the background, he spoke about life and death. Our Pastor told the crowd that Jasmine was a special young lady, active in the scouts and a faithful member of our church. She had heard the call and trusted Christ as her savior a year before. With Kenroy, his right hand man, holding a flashlight Pastor Mike read from the Bible and assured us that Jasmine was in a better place and it was we who had lost here, not her. Along with others, I wept for our loss. I wept for Chris, a single father raising a young daughter who was now gone. I wept for a world in which monsters live and prey on children. I wept as my kids threw dirt into their friend’s grave. When that was over I picked up a shovel and helped fill the hole. At some point my emotions subsided and it simply became hard work. I looked over to see Pastor Mike with a shovel in his hand, working and sweating and I wanted to stop what I was doing and tell everyone, “If you need a Pastor, that is your man!” Today I regret not doing so. There seemed to be something significant in the fact that people who knew Jasmine were digging her grave and covering her body. Truthfully, when I first arrived on the site I was relieved to see others digging the grave but when I got involved in my part I was glad to do it. I found that I don’t want some backhoe digging my grave, I hope my friends will sweat and cry in the dirt as we did that night. Chris said that Jasmine’s funeral was an adventure, just like Jasmine. As a matter of fact the two of them had recently climbed Victoria Peak together, father and daughter. I think I know Jasmine better today than I did a month ago but she is gone and I won’t get to appreciate that insight and watch her grow. I know Chris better today than I did before this and I will never forget the strength he has shown during a time of unimaginable tragedy. Several of my friends and I, all fathers, have recently uttered the question, “Can you imagine?” No, we cannot. I can only have faith that God’s promise to Paul is true for us as well. Paul asked God, multiple times, to remove an affliction, God’s response was, “My grace is sufficient.” I cannot imagine how that can be, but I pray for God’s grace on Chris Lowe. Living in Belize is an adventure! The majority of the roads are dirt, the traffic laws are lax, there are few police, the borders are porous, corruption by government officials is rampant and overt, there are scary tropical diseases, deadly snakes and health care is relatively primitive. Heck, those are the things I like! On the flip side the violent crime rate is astronomical, the justice system is a joke and violent offenders regularly walk free. It’s like anything goes and I try not to be surprised or outraged at the most recent inexplicable thing. Competent and responsible people are generally left to themselves but if you draw the attention of the police they might just beat the crap out of you, well, maybe probably not you. Life here can have an edge to it and it is not for everyone. There is a common expression in parts of Africa that could apply to Belize, ”A.W.A.” Africa Wins Again. It does not mean that anyone actually wins, quite the opposite. The phrase is uttered as things perceived as reasonable to accomplish are not because it seems that people and forces beyond our control are inexplicably working against us. It could easily be a popular expression here in Belize, “B.W.A.” Belize Wins Again! So, why live in Belize? A friend and I were recently kicking around ideas about how we would sell “Life in Belize” without the slick, glossy effect of the tourist brochures or the schmoozy realtor blowing sunshine up your shorts. We thought there should be a little more realism than the “Living in Paradise” angle and sought to boil it down to what we love about this country. The answers were freedom, adventure, cultural diversity, untouched land and the incredible value you can get for your dollar. We never agreed on what might be a good tag line but thought “Land of the Free” was pretty accurate. Belize is a free land and I feel free as I go about my daily life. If I want to build a deck on my house I don’t need a government official to approve it. If you own property you can generally do with it what you want. While I think this country needs more police officers I also find it refreshing that every time I look in my rear view mirror there is not a cop deciding if they should pull me over. I like that I am able to make my own decisions regarding how I drive, if I want to make a U-turn, for example, it’s ok. People can still ride in the back of pick-up trucks. You can ride a bicycle without a helmet. I just don’t think I need the government making day to day choices for me, I see where their choices have landed them and I’m not impressed. Some of my friends have said that the lack of government involvement in our lives is similar to the way the US was in the 1950’s. In Belize the government simply does not have the resources to be intimately involved in our lives, although I suspect they would if they could. A major draw for foreigners considering moving to Belize (or buying property here) is the value they get for their dollar. Taxes, for example, are ridiculously low. On the 165 acres that our Barton Creek Outpost is on the annual taxes are a whopping $500US a year. My friend owns a million dollar resort on the beach in Placencia and his property taxes are $75US a year. He pre-pays multiple years at a time. Hello!! My in-laws are trying to downsize from their 10 acres on an island golf course in southwest Florida because their property taxes are a burden. The Income Tax in Belize is about 30% but there are plenty of ex-pats living here who will say, “There’s an income tax?” Sales tax on most items is 12% and there is no Capital Gains tax. Yes I can help you buy property and move to Belize. A 245 acre Mennonite farm for sale for $300,000. It has multiple buildings, 2 creeks and year round, drinkable, fresh water spring. 13 acres of undeveloped property adjacent to Chaa Creek Resort for $17,000. A simple home on 8 acres with a teak farm for $89,000. Seakunga Beachside Resort for just over a million and the property taxes are only $75 a year! Check out www.ForSaleByOwnerinBelize.com for these and other great properties. Annual vehicle insurance is about $250US. Annual registration, $100. Electronics here are twice the price they are in the US. Beautiful hardwood furniture and custom kitchens are inexpensive. I had my appendix removed here for about $2,000. That kind of ethnic diversity lends itself to a wide range of art and music although I admit to being disappointed in the variety of food. The local food is excellent but it is all pretty similar. There, I said it. It is not the average North American that travels to Central America, much less moves here. The people that come here and stick are, well, different. They have been able to recalibrate their lives and thought processes and often have done so late in life. They have developed working relationships with other cultures and, if not blend in then at least learn to live alongside. Coming here from the United States has brought challenges for me that I did not anticipate and with the help of friends, family and faith we have been able to meet those challenges. I’ve only been here since 2004 and who knows, Belize may yet chew me up and spit me out but I’ll always be thankful for my time here. It is a land full of beauty, opportunity and hard lessons. We came to an exotic land looking for an adventure and found one. If you are you looking for something different then maybe Belize is for you. If you want to talk about it feel free to contact me. thing that needs pulling like the trees used to make the lumber for your house. and most everyone is prosperous. Where and when is this place? Is Andy Griffith the sheriff? ask us to borrow anything (though I have rushed a few to the hospital). There are several sects of Mennonites here in Belize, they are all Christian and believe the Bible is the word of God. Some are far more conservative than others and their beliefs about the use of technology vary widely. For example there is another community nearby that drive vehicles, use giant John Deer combines and quite a few of them have motorcycles. After seeing a group of motorcycle riding Mennonites my daughter remarked that she didn’t know Mennonites were allowed to be cool. I think they are not allowed to strive for cool, but that doesn’t mean they can’t be cool. What all the sects have in common is that they work hard, do what they do very well and it is generally accepted that when doing business with them you’ll get a superior product at a fair price. parents, they will inform her parents who will inform her. She will relay her interest, or lack of, back through the same process. The courting process is then slow and supervised and weddings are a large affair attended by everyone in the community. more reasonable water. We lashed these two 12 foot long monsters together and were about to send them on their way downstream when my wife said, “You guys should ride them down.” It seemed entirely unreasonable given the violent state of the flooded creek but since I am a former Hooyah Navy Deep Sea Diver and he was a strapping 22 year old farm boy (who I once saw kill a large steer with a single blow of a sledgehammer) we grabbed a couple of canoe paddles and rode that contraption until we were thrown from it. After delivering the Huck Finn raft on steroids to the mill we went further upstream to retrieve other logs he had dropped. eventually found the girls about a hundred yards off the trail. They were, of course, relieved to see us and quite surprised to see a dozen Mennonite men in the jungle searching for them. Not only were my neighbors ready and willing to help, but they were able as well. They were all very competent in the jungle. where they were from, how they came to Belize and why they live the way they do. Why they live they way they do, this is not a question I had ever asked before and I was interested to hear him explain it. interested in the additional pressure of purchasing and maintaining such a device. How much more would a family have to produce to have things which would enable them to produce more? They have what they need. Working the land the way they do is hard work but it is simple and pure. It provides for them nicely and they do it as a family. Parents work side by side with their children in the fields and at home. They raise their children and do not turn them over to others to be raised. There is no pursuit of things. The lifestyle itself is the reward. Working hard, loving your family and worshiping God with your life. consider their own lives. In a materialistic world of broken homes and an unwinnable rat race the ideals these men discussed seemed reasonable to young university students, as they did to me. I meet a lot of environmentally conscious young people here at Barton Creek Outpost. People wanting to live “green” and “sustainably” but the 500 or so Mennonites here in my area are the real deal. They are truly old school and it is not a passing fad. I suspect all of them put together generate the carbon footprint of an 8 year old boy in the suburbs of North America. I admire many things about the people in this community and the fact that they are committed to a lifestyle that takes little and gives much is something we can all learn from. I don’t know that I could live that life but I have great respect for those that do and I see things in the way they live their lives that make me want to be a better man. wanted to come along. My wife chimed in, “You should go!” I should? I did. Find a way down 1300 feet from the Baldy Beacon area of Belize’s Mountain Pine Ridge to the Roaring River. Deploy inflatable kayaks into Roaring River’s white water. Find the tributary that comes from Belize’s famous 1,000 Foot Falls and hike up to the falls, then back to the kayaks. Ride the whitewater out of the mountains and back to relative civilization extracting near the Achtun Tunichil Muknal cave. Tony Hovis. Rosa’s Hotel . Age: 41 Extensive canoeing experience. Neither cowboy nor Indian. Me, Age: 46 Questionable background and unverified experiences. the mountain to the river. The kayaks weighed about 60 lbs each. middle of this wonderful activity I learned two things. We were all nearly out of water and still far away from the river below that would supply us with more. The porters could not hang. They were too tired and quitting, going back. Reneging on the deal and leaving us with another 120 lbs of gear. there would be no more traversing across the face of the mountain or, God forbid, having to go back uphill some distance to find another route. We climbed and slid down the slippery spine, making our way from tree to tree which was the only thing that kept us from uncontrolled slides down the rain soaked grass & mud surface. The extra weight of the kayaks we were now hauling along was more of a nuisance than a real hindrance and we got pretty efficient in the tree to tree method sometimes making use of the ropes for the more difficult areas. Arran had done a good job of getting us on a descendible spine and we finally made it to the bottom. There was never a doubt in my mind. Laying out the kayaks, our intention was to inflate them, paddle down the most dangerous water I’d ever been in and find a spot to camp. We immediately learned two things. The kayak pump had been broken on the trek down the mountain. The water was rising at an alarming rate. As Tony put it, “I’ll camp here until our provisions run out and then die of starvation before I climb back up that mountain!” Like the ancient Greeks, who burned their boats upon reaching an enemy’s shore, turning back was not an option so while Arran proceeded to blow the kayaks up by lung power we tore the pump apart to see if it could be fixed. Tony has a great, analytical mind for this type of thing and identified the problem and a workable solution which of course involved duct tape. I love duct tape! By the time we got the boats pumped up and gear strapped down the river had risen a foot or so. We briefly discussed camping where we were but instead got into the big water in the interest of further progress and a better camping spot. Within 30 minutes or so Arran and I had been tossed from the kayak twice and the second time I found myseIf in a bit of a pickle. While Arran was swept clear of the swirling, foaming, vortex of death I had been kept in it. I found out this is known as a “keeper”. I learned a couple things while in The Keeper. My heavy boots that had served me so well on the treacherous hike down were not the same asset in a keeper. They were threatening to pull me to my demise. If you’re planning on being in a keeper, keep the boat with you and hang onto it with all that your worth. It can save your life. in that situation. The Keeper, however, reminded me of how fragile life is. Thank you Lord for allowing me to see another day and thank you for reminding me how much I love my life. I am grateful. We pulled in a short while later and settled for a spot in the jungle that Arran hacked out. We strung our Hennessy Hammocks, Arran chopped firewood, made a fire and an amazing meal, his “Cowboy Dinner”. The night before he had taken about 6 pounds of ground beef and mixed it with sliced potatoes, onions, green pepper, cho-cho ( a local vegetable) and seasoning. He divided it in four parcels, wrapped it in aluminum foil and froze it overnight. The packages were now set on the hot coals of our fire, cooked and then consumed by 4 hungry adventurers. Delicious. He credits his mother with the dish, she used to pack it for him when he was but a wee cowboy, adventuring on his own. but AJ, inexplicably , claimed to have none. As I lie in my hammock picking ticks, listening to Tony cuss and Arran giggle I finally drifted off to dream about The Keeper and being eaten alive by small ticks. carried climbing gear & our lunch all in one pack weighing about 60lbs. The terrain was difficult, uphill, with lots of climbing and we were in & out of the tributary’s waters (mostly in) constantly. We were always aware of the hazard of even a small injury becoming a very large issue so we proceeded carefully. Out exit plan for the injured was to pack the individual to the kayaks and battle the river back to civilization, 2 days away. Not a pleasant picture. Deep, crystal clear pools nestled in dark rock formations became so commonplace that I had to remind myself to try and appreciate each one. The pristine surrounding jungle lent a quality to the whole situation that I can only, feebly say, “Reminds me of a movie”. Arran efficiently led the way as we tried to find the easiest path up and over large and small waterfalls and deeper into the jungle, looking for the base of 1000 Foot Falls. Three hours in, and after climbing a number of increasingly large waterfalls, we found the most beautiful jungle pool I have ever seen. It was surrounded by towering, granite cliffs and fed by the giant waterfall, still a short distance up the mountains. The water was emerald green and the mist from the falls, jungle and rain gave it a dream-like quality. I wanted to climb down and bask in it but at that point we made the determination to turn back, resisting the urge to push higher up the falls. The rain, the late hour and our provisions dictated that we turn back despite AJ’s joking recommendation, “Let’s ignore everything we know and push for the summit!” He was referring to the numerous deaths on many expeditions that are attributed to “summit fever”, ignoring what you know to be the safest course of action to make the summit. On the hike out we jumped off many of the same falls we had painstaking climbed on the way in. When possible, we floated down the creek that we had powered our way up and we appreciated the overall downhill attitude of the land. It only took us half the time to get out and Tony the Mule humped the heavy pack the whole way back. We reached the kayaks in about 90 minutes, reloaded and shoved off. accompanied by at least 100 of my tiny traveling companions. I should start a tick circus, I have seen several jump. Awakened to the smell of campfire coffee prepared by Arran, we had oatmeal, nuts and raisins. We loaded our gear and prepared a full day in kayaks. Day three promised to be a long, tiring day with plenty of challenges but nothing compared to the difficult hiking and big waters of day one & two. I was looking forward to it. respect for and is like my brother. Tony, my other brother from another mother, is a veteran of three La Ruta Maya races and knows his way around a canoe aplenty. with a gentle sweep of his paddle is like watching peace amongst the chaos. don’t stick to him either. We started our third and final day in the mountains where the amazing scenery continued with towering, sheer cliffs and rapid drops in elevation resulting in just a few more big’ish rapids. The terrain started to level out after a few hours but we still found plenty of smaller rapids to keep our focus and help make it fun. We eventually got down into jungle with cohune palms on the riverbanks, iguanas in the trees and AJ even hollered, “Look, a Tapir!” This of course scared it off before the rest of us could see it but we did get to hear it running off through the bush, terrified by the thunderous voice of Ajinder Garcha, wildlife guide. There were lots of laughs, kayak battles (“Prepare to be boarded!”) and an epic nautical engagement fought with figs. We abandoned our fig battle at the extraction point where we pulled our kayaks out lit more Cuban cigars and hitched a ride to the highway. pleased with all sides and grateful for the glimpse. Here is the video I made documenting the trip. Be sure to check it out if you liked this story. Multiple day kayaking expeditions can be scheduled with Cowboys & Indians Expeditions, the fledgling endeavor of two very experienced, competent guides, Arran Bevis and AJ Garcha. Contact Arran through www.metbelize.com or AJ through www.seakunga.com . Seakunga Adventure Center also runs trips throughout Central America and Cuba. In your home town, a black man and a white man walk into a mechanic’s shop. They both ask what a brake job cost. The mechanic tells the white guy $150, he tells the black man its $200. Is that racist? the old Datsun, regardless of race. Can you make a practice of that where you live? What about the common practice of hiring a native born individual before a foreign born worker regardless of qualifications? Personally, I am opposed to that practice in my home town and everywhere else. I think it has a negative impact on the business, the consumer and does not encourage excellence. Three strikes. Regardless of whether or not those things are racist, and I don’t know that they are, racial tensions are commonplace here in Belize. It may or may not be something you see as a tourist but it is absolutely something you become aware of living here. As a friend of mine said yesterday, “You want to know about racism here? Just add alcohol.” He was referring to the magical transformation of the seemingly friendly local turning hostile under the influence of alcohol. It is something most ex-pats here are familiar with. I’ve heard, “My parents would be ashamed of me if they saw me with you.” and “I’ll never apologize to a white man!” among many other such statements. It is the consensus among most expats I know that Belizean government officials, for example, seem to go out of their way to give foreigners a hard time. The practice is not limited to Immigration, nor is it fair to say that every official there is guilty, but most agree that they appear to make things difficult on purpose. Racism is not restricted to Belizean against North American. The Belizeans and Guatemalans don’t seem to like each other the Maya are treated badly across the board. We have a relationship with a Maya family in a nearby village and, because of their heritage, they have a long history of being treated poorly by their non-Maya neighbors. Physical abuse and exclusion are a part of their lives. Growing up as the victims of racism is a stark reality for them. The Chinese own most of the grocery stores in Belize and it is common practice to walk in and call out, “Chineeee! Gimme 2 bag ice!” or “China-man! Where de Coke?” I’m not sure if calling them “Chineeee” or “China-man” is racist but I know that if I walked into a shop in my home town and called out, “Chineeee! Where’s my dry cleaning?” I’d turn some heads. What if I walked into Circuit City and said, “Hey black man! Where de flat screen?” How would that go over? resents a group of people for their perceived economic advantage? I have Mexican friend here who is sometimes called a gringo because he is perceived to be from the US. He is an outsider, a “gringo” to some locals. An American friend of mine was recently described as, “…the white, black guy.” His skin is dark but he’s affluent and from the US so he’s described as white. race (thank you Mom & Dad). If anyone in the military had inclinations toward racism the frequent training and instruction we received on the subject would certainly have helped squelch, at least, the expression of it. After serving 12 years I can honestly say that I do not think racism was a problem in that environment. I think the reason is that we were trained to be respectful of others and evaluate people based on performance. That might not be the perfect way to do things but it makes sense to me. I think people need to be trained how to act, otherwise fear and distrust, among other things, can become driving forces that lead to skewed thinking resulting in bad behavior. man!”, or “Chineeee!”. Truthfully, I don’t mind being called “white man” and I know the Chinese don’t mind their tag. Can we all try to be respectful of others, evaluate people based on how we see them act and treat others as we want to be treated? That might not be perfect but it makes sense to me. “Guess”, the beautiful blonde in my bed replies. The younger blonde stirs, not wanting to get up just yet. “7:50, it’s late”, she says. The three of us have slept in a bit. My wife, 3 year old daughter and I get up to meet the day. “Shhhh, listen”, our daughter Cyan says as she wakes, “I hear a toucan.” Living in the jungle has its advantages and waking up to the sounds of croaking toucans, screeching parrots and the bizarre “gobbling” of the cha-cha la-ka’s is a daily treat. Logan, our 9 year old son, has pitched a tent a short distance away at our backpackers’ campground & hostel, Barton Creek Outpost. We walk down there to find that Logan got scared during the night and chose to sleep on the ground, near some backpackers in hammocks. He’s a tough little jungle boy but he’s still a little boy. Logan is sometimes called Mogley after the kid in “The Jungle Book”. He has lived more than six of his almost 10 years here at the Outpost and is Mogley in many respects. He once offered to take 6 backpackers on a jungle hike and about 45 minutes into it three of them, convinced they were lost, decided to break away to find their way back. Logan returned to the Outpost 20 minutes later without them & told us what happened. I gave the wayward souls another hour or so and went looking for them. I found them a short distance from our place, exhausted and in agreement, “We shouldn’t have left Logan!” He was 8 years old at the time. Our soon to be 13 year old daughter Kaitlyn is another child of the rain forest. Three years ago we had the opportunity to get her in a “Bush Medicine Camp” hosted by internationally renowned teacher and author Dr. Rosita Arvigo. After being there a day Kaitlyn told me that the best student in camp would receive the “Director’s Bush Doctor Award” and she wanted to win it. Kaitlyn is bright, funny, artistic and a beautiful person but she had never sat in a formal classroom at that point and I hoped she wasn’t setting herself up for disappointment. At the end of the 2 week camp I sat with tears in my eyes as I watched my daughter receive Dr. Arvigo’s Bush Doctor Award. She was invited back the following year to assist the counselors and has a special relationship with “Ms. Rosita”. Today Kaitlyn regularly shows people around the Outpost property identifying medicinal plants and showing then that termites are edible. She loves to chat with her friends on Facebook, helps take care of her 3 year old sister, minds her parents and has my respect and admiration. Why was I ever worried about having a girl? My wife and I are about to celebrate 10 years of marital bliss, we’ve been married 16 years…..but seriously folks… Our 16th anniversary is coming up and we are waffling on what to do. We do know it involves leaving the kids with friends for 2 days. It looks as though we’ll hole up in a hotel in nearby San Ignacio with AC, TV, new movies, chocolate and one another. It might not be glamorous but it sounds like an excellent way to spend a couple of days! We recently got a couple of horses at the Outpost, a momma (Shady) and her 11 month old philly. I don’t know anything about horses but thankfully one of my best friends is an expert and we have a community of Mennonites nearby and much off their lives revolves around their horses. I am surrounded by good horse people. Our 12 year old Kaitlyn loves horses and has been spending time at Mountain Equestrian Trails (MET) learning more about riding and, more specifically, caring for horses in preparation for their arrival. A week after the horses arrived the philly was found lying in the pasture and it looked as though we would lose her. An expert horseman & elder Mennonite was kind enough to come look at her and he had some ideas but we also went meet with their resident horse & animal guy who prescribed some meds but was not confident that she would make it through the night. I also made contact with my friend at MET and he came down that night but made the same diagnosis, bad. He, like the Mennonites, suspected a stomach issue so with some difficulty, we ran a hose through the horse’s nostrils down to its stomach, ensuring we are not in her lungs, and put vegetable oil in her stomach in hopes of potentially loosening things up. This is also a procedure the Mennonites brought up and we saw it for what it was, grasping at straws. There were no immediate results and the next morning I found that we had lost her. A sad day to be sure and digging a giant grave for a horse in hard rocky ground didn’t make the day any better. The dreaded task was accomplished with the help of a volunteer and towards the end a Mennonite neighbor came by and showed me how to really handle a pick and shovel. Thank you, sir. A week later Shady surprised us with the birth of a new philly that the girls decided will be named “Luna” because of her beautiful white color. Luna is in good shape, much loved and well cared for. Apart from horses I figure I have become a moderately competent handy man since I’ve moved to the middle of nowhere. Last night our only source of electricity, the diesel generator, wouldn’t start so I hunkered down in front of that beast and began the troubleshooting. I used to call the path to the generator the “Trail of Tears”. Today I am slightly more proficient at this kind of thing and brilliantly deduced that the injector wasn’t working properly. Well, 1st I deduced that the fuel hose was leaking so I took 30 minutes to repair it only to find it wasn’t the main problem. I then removed the injector, cleaned it, reinstalled it and the generator started right up. I was a legend in my own mind and was, in fact, celebrated at the Outpost by the people who were, only moments before, preparing dinner by kerosene lanterns and candlelight. Living in Belize has been a new chapter in my life, one that I started just 2 months shy of my 40th birthday. Who says that you can’t teach an old dog new tricks? In the last 6 years I have learned to dig a deep grave, build a website, construct buildings, install lighting, run a rubber hose up a horse’s nose and squeeze maggots out of the skin of my family. I also barely escaped a catastrophic outhouse collapse, teetered my Land Cruiser on the lip of a 25 foot sinkhole, had dengue fever (twice), a flesh eating parasite (twice), paddled in the longest three person canoe race in the world (twice) and have killed deadly snakes (many times). Who knows what tomorow will bring?